Goal – This long-term project has been focusing on the communication system of the killer whale, a species thought to have a learned vocal dialect. We have been collecting data on both the elements of their repertoire and associated behaviors by taking advantage of HSWRI’s unique access to multi-generational groups of whales at SeaWorld. Importance – So far, evidence for vocal learning is rare in social non-human mammals. Thus, there are important basic research questions about why social species learn their repertoires and how their communication system might have evolved. In addition, since sociality affects management choices and vocal communication is thought to be an important marker of social bonding, what we learn can be applied to conservation of populations at risk. 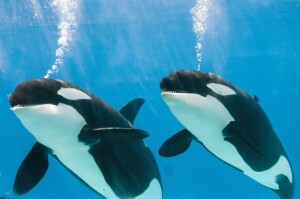 Background – Killer whales have repertoires of stereotyped calls (calls that always sound the same) indicating membership in a family group and also higher levels of social organization. Based on studies of free-ranging killer whales, they’ve been called social dialects. Although non-specialists often take social dialects for granted – the anthropocentric logic is, “Why wouldn’t an intelligent social mammal have a dialect?” – they are apparently rare among social mammals. Scientists don’t really understand how the dialect of killer whales functions or how it might have evolved. In particular, it isn’t clear why the vocal signaling system of killer whales seems to differ from that of the related and well-studied bottlenose dolphin, which probably encodes group affiliation by imitating individual-specific calls. To resolve the conundrum, we’re working to understand, in a systematic step-by-step way, what killer whales learn, from which individuals, and how what they learn is used during interactions. In 2001, a multichannel hydrophone array (a network of underwater listening devices) became available in one of the pools at SeaWorld San Diego. This was an important facility because killer whales, like other dolphins and whales, generally do not give any behavioral indication when they’re calling. The array allowed HSWRI bioacousticians to collect calls attributable to individuals with greater accuracy and relate them to the whales’ behaviors. Recently, they used this technique to show for the first time that killer whales disproportionately pair a particular type of call with a specific visual signal, a stream of bubbles (Bowles et al. 2015). This work paves the way for studies of social context, which will help with a long-term goal, showing how vocal behavior functions in killer whale societies. Such data have also helped to show that rich, context-linked information must be present in streams of animal vocalizations (Kershenbaum et al. 2014). SeaWorld facilities also provide a unique opportunity to study vocal learning. Whales with different dialects coexist there, making opportunistic cross-fostering and cross-socializing experiments possible. Such studies are the “gold standard” for understanding vocal learning in social mammals. It takes monitoring of individual vocal behavior over long periods to obtain the needed data because whales grow and dialects change slowly. In 2014, based on data accumulated from 1986 to 2012, Dr. Bowles and her graduate students provided the strongest evidence yet that killer whales can learn calls from one another (Crance et al. 2014). In another study, they showed that learning is possible even across species – the small number of killer whales that have lived with bottlenose dolphins turn out to learn from them as well (Musser et al. 2014). Both studies showed that learning is promoted by social relationships. This research has been supported through private corporate and individual contributions to the Hubbs-SeaWorld Research Institute including SeaWorld Entertainment, with in-kind contributions from the SeaWorld parks. Graduate students, interns, and faculty from the University of San Diego and other regional universities have given generously of their time to make the project a success. The work we are doing is unique within the zoological community worldwide. Although we have been successful in demonstrating some “firsts” with available resources, further support is needed to refine methods, automate behavior observations, and develop sophisticated tools for processing of the whales’ vocalizations. Bowles, A.E., D.M. Grebner, W.B. Musser, J.S. Nash, and J.L. Crance. 2015. Disproportionate emission of bubble streams with killer whale biphonic calls: perspectives on production and function. JASA Express Letters 137(2): EL165-170. Kershenbaum, A., A.E. Bowles, T.M. Freeberg, D.Z. Jin, A.R. Lameira, and K. Bohn. 2014. Animal vocal sequences: not the Markov chains we thought they were. Proceedings of the Royal Society B: 20141370. Musser, W.B., A.E. Bowles, D.M. Grebner, and J.L. Crance. 2014. Differences in acoustic features of vocalizations produced by killer whales cross-socialized with bottlenose dolphins. Journal of the Acoustical Society of America, 137(4): 1990-2002. Bowles, A.E., and R.C. Anderson. 2012. Behavioral responses and habituation of small cetaceans and pinnipeds to novel objects and simulated fishing gear with and without a pinger. Aquatic Mammals 38(2): 161-188. Bowles, A. E., W. G. Young, E. D. Asper. 1988. Ontogeny of stereotyped calling of a killer whale calf, Orcinus orca, during her first year. Rit Fiskidieldar (Journal of Marine Sciences, Reykjavik, special volume) 11:251-275. Moore, S. E., J. K. Francine, A. E. Bowles, and J. K. B. Ford. 1988. A preliminary analysis of the calls of killer whales, Orcinus orca, from Iceland and Norway. RitFiskidieldar (Journal of Marine Sciences, Reykjavik, special volume) 11:225-250. Evans, W. E., A. V. Yablokov, and A. E. Bowles. 1982. Geographic variation in the color pattern of killer whales (Orcinus orca). Reports of the International Whaling Commission 32:687-694. Awbrey, F.T., J.A. Thomas, W.E. Evans and S. Leatherwood. 1982. Ross Sea killer whale vocalizations: preliminary description and comparison with those of some northern hemisphere killer whales. Reports of the International Whaling Commission 32:667-670.